A pre-workout supplement can be the difference between smashing your weight lifting and cardio goals…and a slow, lethargic workout that ends in frustration. The problem is there are hundreds of pre-workouts on the market – and most are marketed at men. Should I Really Try It? Does Everyone Need a Supplement Before the Gym? Let’s be honest…pictures of veins popping from swollen biceps don’t appeal to most women. They also give the impression that pre-workouts aren’t meant for the female body. Preworkout supplements can help you have more consistent workouts – regardless of gender. If you want better athletic performance, increased endurance, enhanced focus and stronger muscles, a female pre-workout is essential. Not only that, but some pre-workouts can speed up your metabolism, burn fat and help you build a toned, lean body. In this article, we’ve put together a list of the best pre-workout supplements for women. Each of these supplements will help you achieve your fitness goals faster without costing a fortune. Even though most pre-workouts are marketed at men (think swollen muscles and aggressive images), most are also suitable for women - including the majority of PWOs on our list of the best pre workouts. While supplement brands would like you to think their pre-workout can instantly build huge muscles, the reality is that they don’t – even for men. They won’t for you either. No Male Hormones. Some pre-workouts include testosterone-boosting ingredients. Examples include L-Aspartate and D-Aspartic acid. Women looking for a pre-workout should avoid these supplements. Properly Dosed. While the ingredients list of a preworkout drink is important, the dosage makes all the difference. Many low-quality pre-workouts are under-dosed – particularly those targeted at women. This means you’re paying for the ingredients without getting the full benefit. If in doubt, stick with our recommendations below. More Than Just Caffeine. Some of the worst pre-workout shakes are little more than caffeine powder. While caffeine is great for focus, especially when Netflix and glass of red wine is more tempting, pre-workout should provide much more. Look for a powder that has ingredients that are proven to boost focus, energy, endurance, strength, muscle recovery and metabolism. Non-Proprietary Ingredients List. Some pre-workout brands hide their ingredients behind a “proprietary mix” label. They want you to think they’ve developed a unique formula that works better than other supplements. In reality, the label just hides under dosed ingredients or unwanted extras. Don’t Overdo Creatine. Creatine is vital for athletic performance, and can promote strength gains and lean muscle mass. It can also make you feel less fatigued during exercise. Women usually don’t need as much creatine as men though – especially if you’re worried about the extra water retention and bloating it can cause. If you’re taking a pre-workout supplement that’s marketed at men, you may want to take a reduced dose. This is because men usually weigh more than women. Don't worry about doing this for supplements marketed at females though. Also, don’t forget carbs! If you haven’t eaten a meal a couple of hours before a workout, a few extra carbs can fuel your workout session. A pre workout for women may also cause mild stomach pain on an empty stomach, although this depends on the ingredient list. We think the pre-workouts below are the best options for women. Each provides a balanced ingredient list that’s suitable for female physiology, without sacrificing potency or performance. They can also help you reach your fitness goals faster and more consistently. 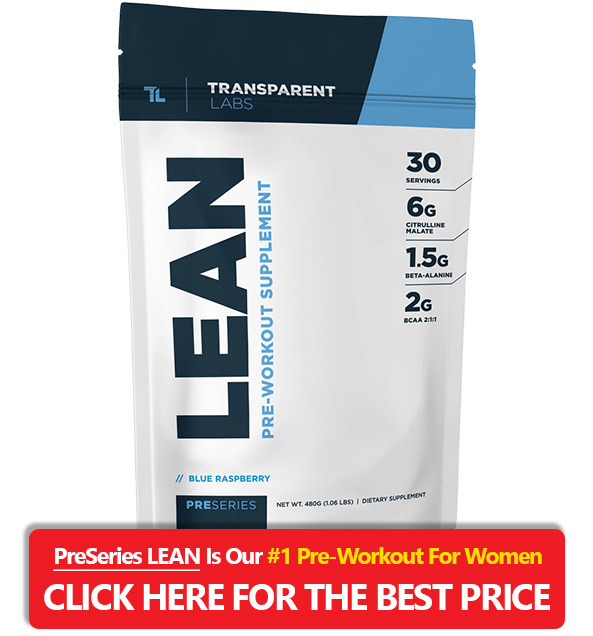 If you’re looking for the best pre workout for women, the PreSeries LEAN is our top pick. We simply don’t think other pre-workouts can match its combination of fat burn, intense focus and improved physical performance. Unlike PreSeries BULK, LEAN pre-workout isn’t just about building large amounts of muscle mass – which often isn’t what women want. Instead, it helps burn stubborn fat, while preventing muscle loss, enhancing endurance and boosting your workout performance. One of the best things about PreSeries LEAN is the clinically effective doses. Transparent Labs have clearly put a lot of effort into ensuring none of the ingredients are over or under dosed. There are also three flavors available: Blue Raspberry, Green Apple and Strawberry Lemonade. Our favorite is Green Apple, but you’ll probably want to experiment. Citrulline Malate (6000mg). Citrulline is one of the most important ingredients in a pre-workout supplement – so it’s great that LEAN includes the full recommended dose of 6000mg. It improves athletic performance, endurance and strength, so you can work out harder and for longer. Betaine (2500mg). Supplementing Betaine can trigger a muscle growth response that’s independent of testosterone (which is important for women). It can also increase the amount of reps you can do in a workout. BCAAs (2000mg). LEAN includes BCAAs in a 2:1:1 ratio. In combination, these amino acids increase strength, prevent muscle loss when you’re burning fat and increase your metabolism during a workout. Synephrine (50mg). Studies have shown supplementing synephrine “raises resting metabolic rate by 65kcal.” This is one of the ingredients that causes PreSeries LEAN to burn stubborn fat. Hordenine (25mg). Another fat burning ingredient is Hordenine. This is a natural substance shown to increase metabolism and energy levels. Caffeine + L-Theanine (180mg + 360mg). Caffeine is in all pre-workouts (except non-stim supplements), as it’s proven to increase energy and allow you to complete more reps. The 180mg contained in a serving of LEAN is perfect for an energy boost without negative side-effects. In addition, L-Theanine, when supplemented in a 1:2 ratio with caffeine, smooths the effects of caffeine and prevents jittering. 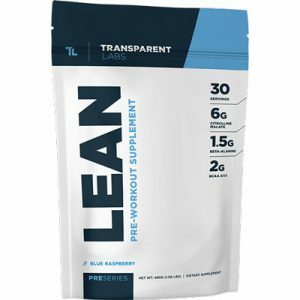 As you may have noticed, LEAN doesn’t include any creatine. This is great for women who are concerned about water retention. If you want to maximize your workouts, however, we recommend taking creatine separately. Summary: PreSeries LEAN is the best pre-workout for women – especially if you want to burn fat while increasing strength and performance. We particularly like the large dose of Citrulline and caffeine/L-Theanine stack. Highly recommended. If you’re looking for an ultra-focused workout and faster progress, 4 Gauge is one of the strongest pre-workouts on the market. It’s not for the faint hearted, but can provide a jitter-free energy boost, incredible pumps and explosive power. 4 Gauge is designed to maximize your workout in four key areas: strength, focus, stamina and pump. The goal is to provide those “in the zone” workouts on a consistent basis, so you can reach your potential faster. Another bonus of 4Gauge is that it doesn’t include artificial sweeteners and has a completely natural ingredient list. L-Citrulline (6000mg). 4 Gauge has the full 6000mg of recommended Citrulline. This promotes nitric oxide levels while increasing training volume, blood flow and muscle pumps. Caffeine & L-Theanine Stack. Like LEAN, 4 Gauge includes caffeine and L-Theanine to provide a clean and jitter-free nootropic effect. It has slightly less caffeine though, which some women may prefer. Rhodiola Rosea (100mg). A less common ingredient in 4 Gauge is Rhodiola Rosea. This is derived from a herb that can prevent fatigue while boosting cognition. In terms of your workout, this means instant motivation. Beta Vulgaris (300mg). Otherwise known as red beet, this is a nitric oxide booster that can increase athletic performance by maximizing oxygen usage. Creatine. Unlike PreSeries LEAN, 4 Gauge includes creatine monohydrate which has a range of performance and muscle building benefits. 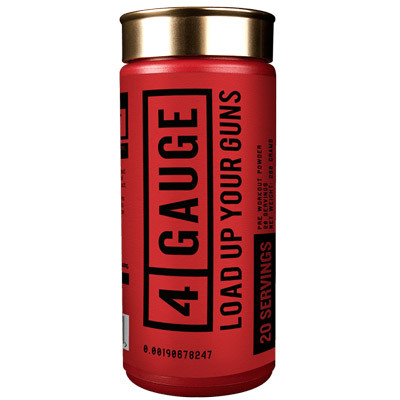 Summary: If you want a pre-workout that provides immense power and near-limitless energy, 4 Gauge is a great choice. It doesn’t have the fat burning matrix or BCAAs included with PreSeries LEAN though, so for women who want to lose weight it’s not the best choice. Athena Intense is an excellent all-round pre-workout that’s specifically designed for women. Whether you’re running, cycling or weight lifting, it can provide a rapid boost in performance and plenty of motivation to push through your workout. As you would expect from a pre-workout placed at #3 on this list, there are no proprietary ingredients. Every ingredient is listed individually so you know exactly what you’re putting in your body. A bonus is that it tastes great. It also dissolves quickly and easily in water, so you aren’t left with sediment. Compared to the bitter or downright disgusting flavors of some pre-workouts, this is a welcome surprise! One thing to note is that Athena Intense isn’t as effective at PreSeries LEAN at burning fat. It has some metabolism-boosting ingredients, but lacks components such as Synephrine. It's still one of the best women's pre workout for all-round performance though. BCAAs (6000mg). Athena Intense includes a generous dose of BCAAs in the recommended 2:1:1 ratio. These amino acids are great increasing strength while speeding up recovery. Beta-Alanine (1200mg). If you want greater endurance and the ability to power through set after set, Beta-Alanine is a vital ingredient. We would have liked a slightly higher dose, but 1200mg is enough to increase stamina while forming lean muscle mass. Betaine (750mg). Like PreSeries Lean, Athena Intense includes Betaine that can stimulate muscle growth while increasing stamina. We are disappointed with relatively low dose of this ingredient though. Citrulline Malate (3000mg). The optimum dose of Citrulline is 6000mg, but 3000mg is still higher than many pre-workouts. When it comes to increasing pump, nothing beats citrulline. Caffeine (150mg). We think 150mg – 200mg is the sweet spot for pre-workouts for women. This is enough to provide an energy boost without jitters or loss of coordination. 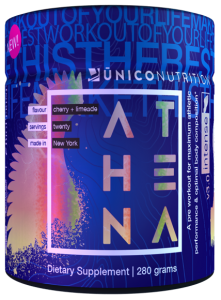 A downside is that Athena Intense doesn’t include L-Theanine to smooth the effects of caffeine, although this is balanced by the Taurine and Huperzine. Other Ingredients. Athena Intense also includes Bio​Perine and N-Acetyl L-Cysteine, amongst others. BioPerine helps increase absorption, while N-Acetyl helps provide long-lasting energy. To summarize the ingredients list, almost everything you need is included in Athena Intense – just not always in the optimum quantities. With that said, nothing is severely under dosed, so all the ingredients provide a noticeable benefit. Summary: If you want a tasty pre-workout that’s designed specifically for women, Athena Intense is our top recommendation. It’s a great all-rounder – although it lacks the fat-burning properties of PreSeries BULK. Lean Body for Her is a Stim-Free pre-workout by Jamie Eason. While it can’t match PreSeries LEAN for fat burn and athletic performance, it’s worth considering if you want a “softer” boost before each workout. As you’ve probably guessed, it doesn’t contain stimulants that can affect sleep and cause jitters. Instead, it uses a combination of vitamin B12, L-Tyrosine, Taurine and Choline to increase mental energy, focus and performance. This pre-workout also doesn’t include any artificial flavors, colors or sweeteners. There are two flavors available: Raspberry Lemonade and Orange Mango. Orange Mango is our favorite – the Raspberry Lemonade is too sour for our tastes. Lean Body for Her doesn’t have the quantity of ingredients found in other pre-workouts. This isn’t necessarily a bad thing, as stripped-down simplicity makes it easier to understand what you’re putting in your body. There are also no proprietary mixes, which we like. Before we get to the ingredients though, let’s make one thing clear: this pre-workout won’t provide the energy, endurance and strength boosts of PreSeries LEAN or 4Gauge. And this isn’t just because it’s a stim-free pre-workout. It doesn’t have the right ingredients to give a real cognitive boost or pump, nor will it give you the energy boost associated with stimulants. So, why is it still on this list? The simple reason is that it provides value for money. This is one of the cheapest pre workouts for women per serving, yet can still provide a moderate boost to cognition and performance without the harsh effects of stimulants. Citrulline Nitrate (1000mg). Citrulline increases blood flow when you’re exercising, which helps you work out for longer. While it’s great this supplement includes Citrulline, it’s under dosed at 1000mg so you won’t get the full benefit. Vitamin B12 (1000mcg). B12 has been included to provide improved focus and mental alertness. As you’ve probably realized, there are some obvious omissions from the ingredients list. The best no-stim pre workouts replace stimulatory effects with other ingredients – but Lean Body for Her fails to do that. There are also no real metabolism boosters for burning fat. The saving grace is that it’s cheap and still provides some benefit. If you’re on a tight budget and want a no-stim pre-workout, it’s worth considering. Summary: Lean Body for Her is a cheap pre-workout that’s useful if you don’t want stimulants (such as caffeine). It won’t increase your metabolism, energy and focus as much as PreSeries LEAN, but for a subtle boost it provides good value for money. FitMiss Ignite. Ignite has a proprietary ingredient blend, which is why it didn’t make our top list. It appears to have a decent ingredient matrix, including tyrosine, Beta Alanine and Beta Vulgaris, but without knowing the doses we can’t recommend it. Supremacy for Chicks. We’ve been asked about this pre-workout several times, but it seems to have been discontinued. Strong Girl. StrongGirl pre workout is mainly designed to promote energy and focus, although it also includes beta-alanine for extra endurance. Like FitMiss Ignite, however, it has a proprietary blend. Women’s Elite. We don’t recommend Women’s Elite. It has an unbalanced ingredient list and a proprietary performance blend. Gym Angel Energy Angel. If you’re looking for a simple pre-workout without a long ingredient list, Energy Angel could be a good choice. There are no artificial colors or fillers, and it doesn’t include creatine to prevent bloat. While it contains caffeine, betaine and L-Carnitine, it lacks important ingredients such as Citrulline, which is why it didn’t make our top 5. NLA for Her Uplift. When you first look at the ingredients list for Uplift, it seems to cover all important basis. It contains caffeine, Beta Alanine, L-Carnitine, Choline, amongst other ingredients. The problem is that it’s a proprietary blend, which means you don’t know how much is included in each serving. It also contains a lot of filler. If you’ve never used a pre-workout drink before, the thought of taking one can be daunting. Preworkouts can seem expensive and confusing, especially for newcomers to the over-hyped supplement market. Let’s take a step back though. Do you ever have those gym sessions where you feel 100% focused and full of energy? Perhaps weights you usually struggle with suddenly seem light. Or your 20-minute HIIT session flies by and you smash your previous record. But then next time everything is different. You feel sluggish before you even change into your gym gear. Your legs feel like lead on the cross trainer and even your warmup sets seem heavy. Before long, you’re texting friends or watching a funny YouTube video between sets. If so, you’re not alone. Training at full intensity is the only way to get the body and results you want - but your focus and endurance varies through no fault of your own. Some days you’re on it. Some days you’re not. Most of the time it’s impossible to know why, as it could be related to food, sleep, hormonal changes or a host of other factors. Fortunately, there’s a solution: a high-quality pre-workout supplement. Pre-workouts take the randomness out of your workouts. By providing specific doses of important ingredients before you head to the gym, these supplements can boost your energy, strength, endurance and even protect your muscles. In other words, preworkout drinks help you progress faster and reach your goals in less time. Don’t be afraid of trying pre-workouts. The ones we’ve listed on this page are all great for women – and you can start at a smaller dose if you’re concerned. No, not everyone needs to take a pre-workout drink. You can certainly reach fitness goals without one – and they aren’t a substitute for hard work. You’ve Hit a Plateau. Have you been going to the gym for months without making any real progress? If so, a pre-workout can help you develop a lean, feminine body while smashing through workout plateaus. You Want Faster Results. Boosting your energy, endurance and athletic performance before each workout allows you to work for longer and with more intensity. You Often Feel Lethargic Before a Workout. If you’ve had a long day at work or looking after the kids, a high intensity workout can seem impossible. The energy and focus matrix of the best female pre-workouts is a quick solution. So, when shouldn’t you take a pre-workout? If you have plenty of natural energy, you may not need one to get the most out of your workout. Pre-workouts aren’t essential for fitness progress, no matter what the marketers say. The most important thing is to train hard and eat healthily. You should also talk to your healthcare provider before taking pre-workouts while pregnant or breastfeeding. As a general rule, you should not take PWOs during pregnancy or nursing – most pre-workout warning statements specifically advise against taking them. The best pre-workouts for women help you reach your goals faster. They provide a rapid energy boost, improve strength and enhance endurance, without unwanted side effects such as jittering, bloating or stomach pains. 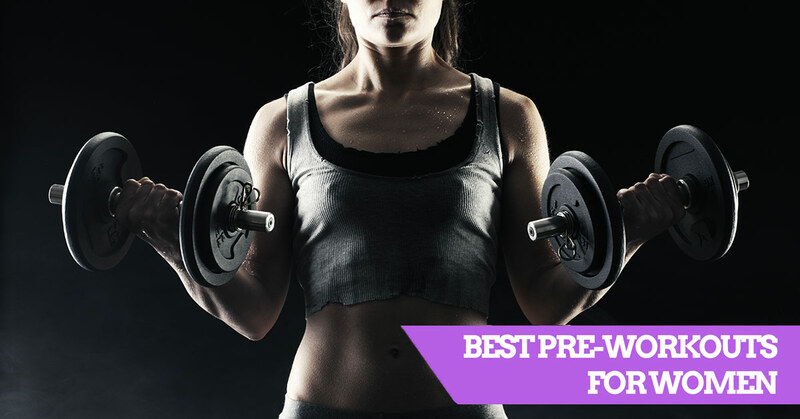 Our #1 pick for a woman’s pre-workout is the excellent PreSeries LEAN. The combination of fat-burning, improved strength and fast energy boost make it hard to beat. It also has a balanced ingredient list with proper doses. Do you have any questions about choosing the best female pre-workout? Or have we missed your favorite PWO? Let us know in the comments section.